Liverpool have been handed a potentially huge injury boost as James Milner should reportedly be back in action within a month. The 32-year-old went off in the draw against Manchester City with a hamstring injury, which initially looked like it could be a pretty bad one. However, it’s now claimed the Reds could see him back a little earlier than expected as the damage doesn’t seem to be as serious as it initially looked, according to the Telegraph. Milner has been a hugely important player for Liverpool in recent times, keeping summer signings Naby Keita and Fabinho out of the team for most of this season so far. Despite his age, the former England international has improved immensely under Jurgen Klopp and must now be one of the German’s first names on the team sheet for most games. 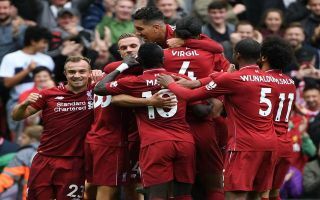 Unfortunately, Milner could not stay on long enough to help LFC to a win against his old club City at the weekend, but fans will be confident the club’s improved squad, with signings like Keita and Fabinho to fall back on now, can help them through the next few weeks.